By way of a change (not!) 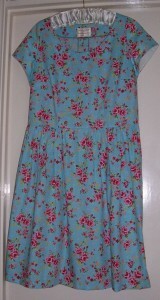 this week I went “off plan” and made a new dress. At least I did keep to the resolution to make alternate projects using fabric from my stash. I am not absolutely sure of the fabric constitution nor where and when I bought this long length of super-wide Toile de Jouy printed cotton(?) but it has been in my stash for several years. It may have come from Abakhan Fabrics in Mostyn, North Wales but I can’t be certain. Having checked out various Pinterest boards I decided to use my TNT bodice pattern with the lined cap sleeves, a full gathered dirndl skirt and the usual side-seam pockets. 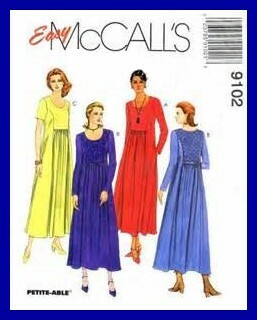 I again scooped the neckline the same as the Navy/White check dress but re-drafted the cap sleeves so that they would have a gathered sleeve head. When cutting out the bodice and the front skirt panel I took care to centre up the design. Also as the fabric was very wide I shaped the side seams so that the amount needed to be gathered into the waist seam was slightly reduced. At first fitting I increased the depth of the body darts on the front bodice and checked the gathers on the sleeve heads. Construction went well, sewing was entirely by machine with the exception of a hand-stitched hem – that took a while as the circumference of the skirt was 180”. 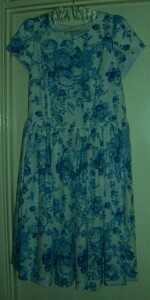 I now have a lovely new dress to wear tomorrow when I meet up with an old friend for lunch! Last week I tutored a class on the above. 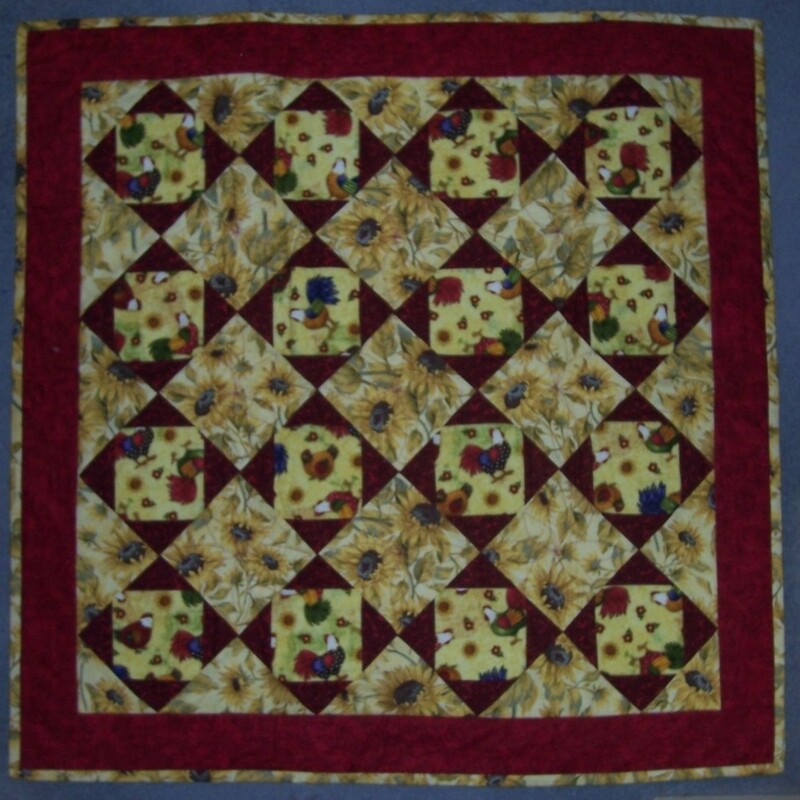 I was shown how to make Magic Squares many years ago by Meg Leach of New Threads, Weyhill Fairground, Hampshire and have made several quilts using this method. 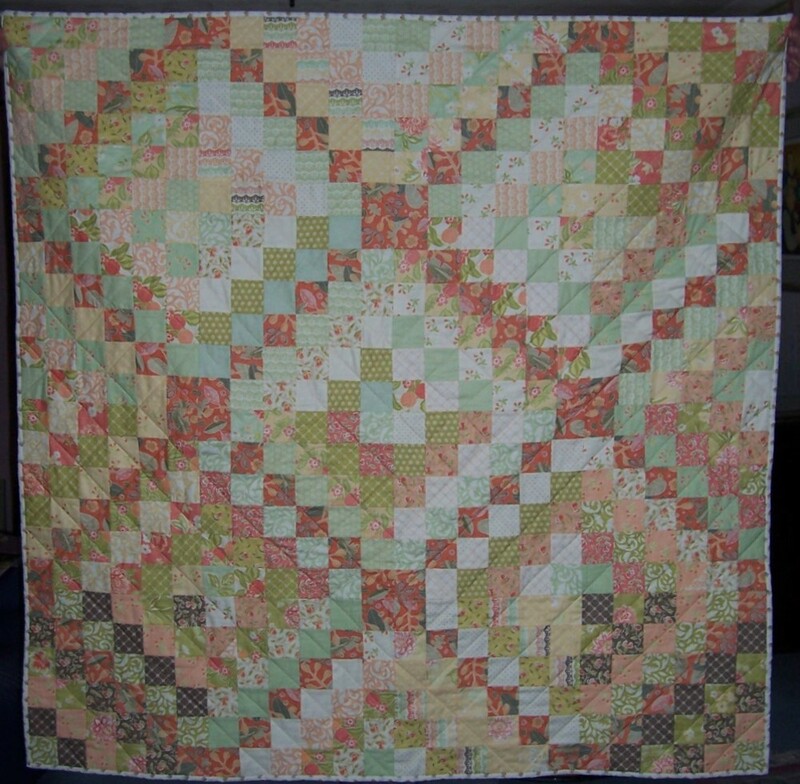 Demonstration quilts shown below. 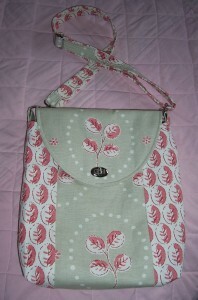 The first project was made using two charm packs “Simply Luscious” plus some yardage from my stash. As the triangles are all on the bias, in order to stabilise the block you need to stitch the magic squares to fabric that is on the straight grain. 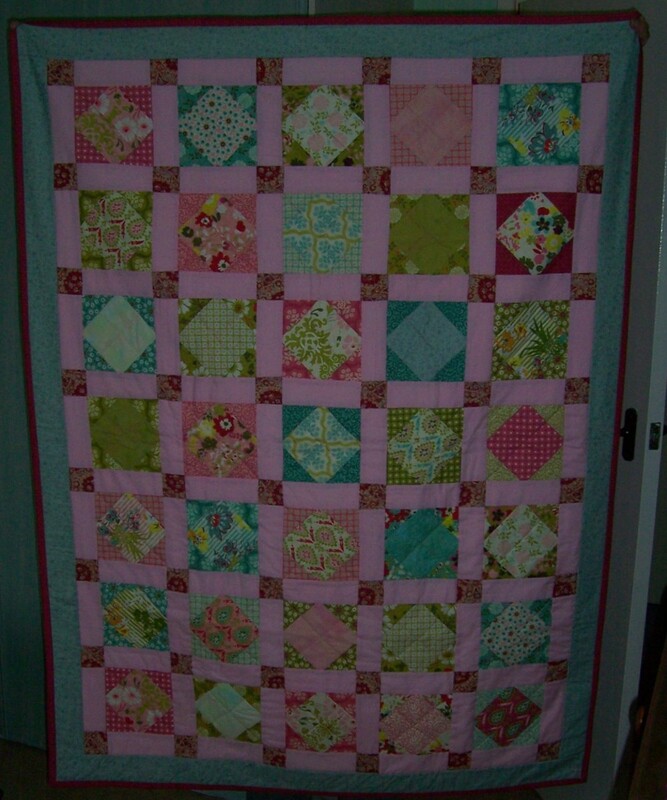 I used a plain Pink for the sashing with cornerstones in a complimentary fabric cut from a spare fat quarter. 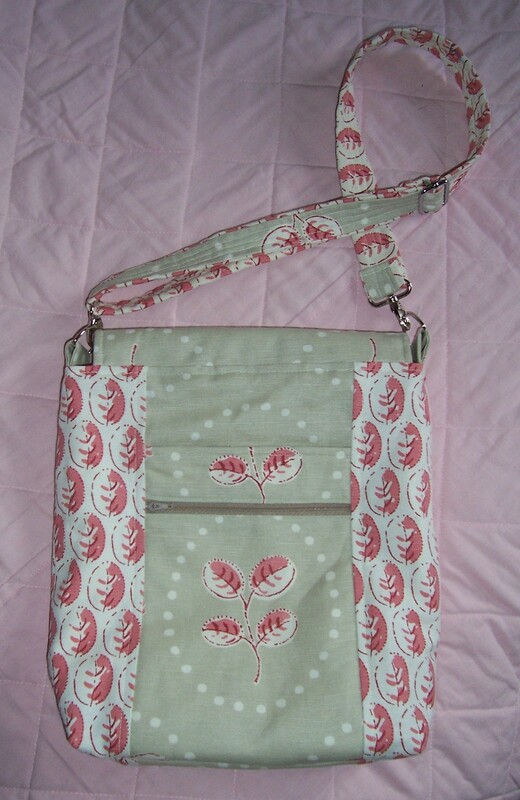 The second project used some Fat Quarters purchased from Sew Simple in Taverham, Norfolk. This project features a print of Chickens and Sunflowers. Chickens – it was meant to be a gift for my sister who was born in the year of The Rooster and also keeps chickens in her back garden. This time, to stabilise those bias edges I cut squares and then set the blocks “on point”. Although the lap quilt was completed back in 2012, it has not yet found it’s way to Catherine! I really need to make another, this time featuring rabbits to be appropriate for me. Another project to go on the “TO DO” list! 1. Starting with 2 x 5” squares, put right sides together and press. This helps the squares to stay together. Stitch with a 1/4” seam allowance ALL AROUND. 2. On the side that is to be the triangles, mark an X. 3. Pull the two pieces of fabric apart and finger crease the top square in the centre along one of the lines. Make a small cut along the one of the marked lines. Insert your scissors and cut along the two lines of the X. Please be sure to cut only the fabric with the marked lines. 4. Gently press the triangles away from the centre block and trim away the “fabric ears”. Measure your magic square block and cut another square to match this measurement. 1EP. Lay the squares right side together and repeat step 1 above. Always stitch with the new square uppermost as this is the most accurate. Don’t worry if the square underneath pops out a bit. 2EP Mark an X on the new square and continue as steps 3 and 4 above. 3EP Continue adding pineapple layers until the block is the required size. 4EP Stitch the blocks together using a 1/2” seam to make your quilt. 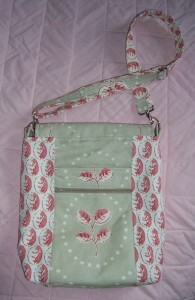 The bags that I have made to Deby’s pattern have proved to be very popular. So much so that in the Autumn term I hope to tutor a day workshop for those that want to make the bag and prefer to have live tuition whilst enjoying the whole experience of a “sewfest” workshop. Happy stitching to all you bag makers out there! For the third incarnation of this lovely bag I used some more Linen Union that was a gift from a friend. 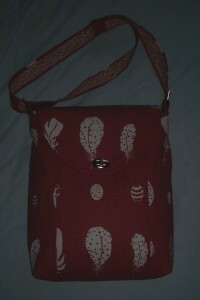 This time the fabric was a dark rusty Red with Off White print of feathers and eggs. For the lining I purchased 1 metre of a co-ordinating quilting cotton from New Threads at Weyhill Fairground. Although I again used a Twist Lock fastening, having already made 2 bags with this mechanism I was now confident enough to place the Twist part of the lock before stitching the side seams of the centre panel. Thus I was able to avoid the fiddly step of insertion when panel seams have been sewn and the area is more enclosed. To avoid the struggle of stitching the strap right sides together and then turning right sides out, I pressed the turnings in on both pieces and top-stitched in place, all with the right sides facing out so that I could ensure an even “faux” piping effect. This time I did not use the swivel hooks, instead the bag is attached with rectangular hardware through the strap ends and the tabs. 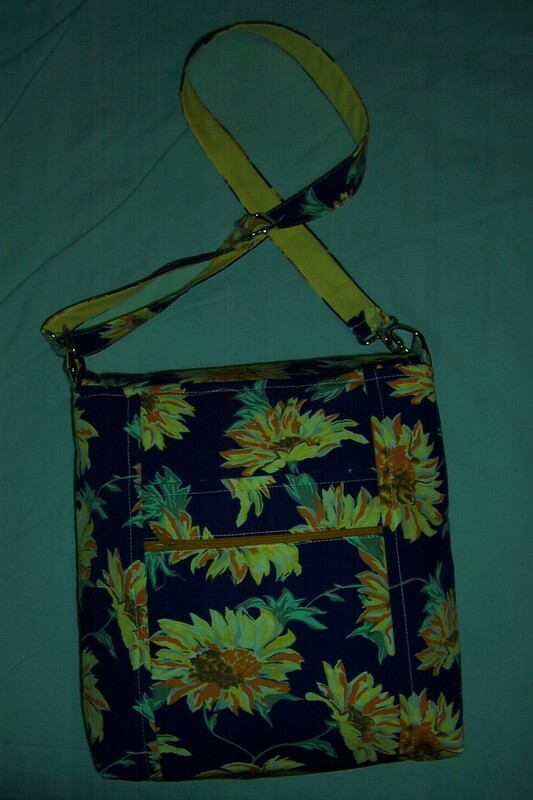 There is an “adjuster” so that the length of the strap can be shortened or lengthened according to my requirements be it shoulder or cross body. I still refer to the written instructions which are set to one side of the sewing machine and I enjoy flipping through the pages from one to the next. 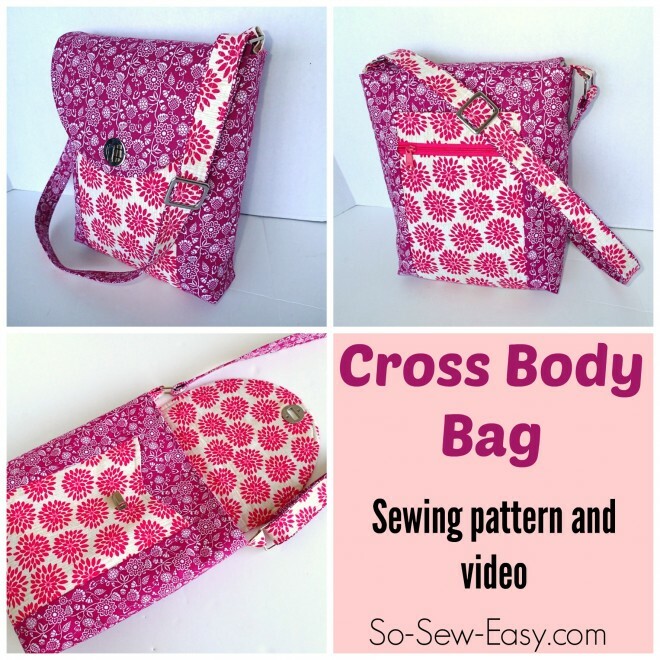 I think that this is the last cross body bag that I will make for a little while – next on the “To Do” list is 1) finish some patchwork and quilting projects and 2) a dress made from Border Print fabric. Having finished the first tester for my birthday dress I identified a couple of changes that needed to be made before I cut into that lovely border print cotton fabric. During a visit to my local Patchwork & Quilting store, New Threads at Weyhill Fairground, I purchased 3 metres of wide cotton fabric that was on sale at just £5 per metre. It is a woven check in very Dark Navy and White and I had a fancy to make the second tester using this fabric. I hacked the scoop neckline from McCalls 9102, a pattern that I have had in my collection since 1997 and has been made up several times. I was undecided on exactly how to finish the neckline. I toyed with the idea of bias binding but eventually drafted facings which were made from White polyester cotton to avoid any “show through” of the check pattern. For simple accent on the neckline I sewed two rows of top stitching. 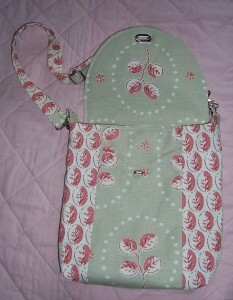 The cap sleeves are lined with the White polyester cotton as are the pocket bags. Apart from re-shaping the neckline which also extended the shoulder seams, the bodice is the same as that used for the first tester dress. The skirt was cut from the full width (60 inches) of the fabric and I shaped the side seams slightly so that there was a little less to be gathered into the waistline. 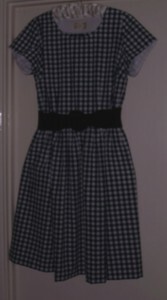 The dress can be worn as it is or with the addition of a belt in Grey, Black or a contrast – RED! 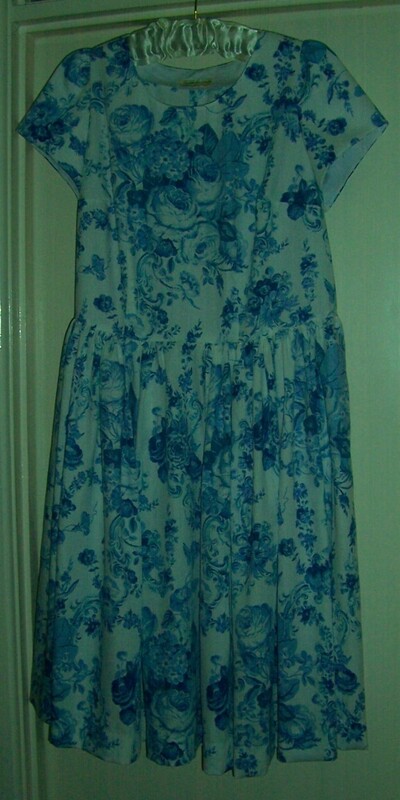 That completes my second tester dress, but now, as usual I have changed my mind about the design to use for the Border print cotton. I have only 3 metres of that fabric so will have to have a think about which design to use. Hmmmmm…. 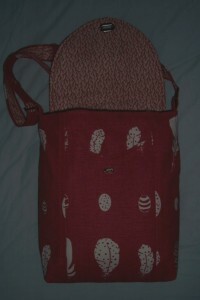 This pattern is now my favourite “go to” design for bag-making! The first version was made using a linen union furnishing fabric and took 6 hours to complete. 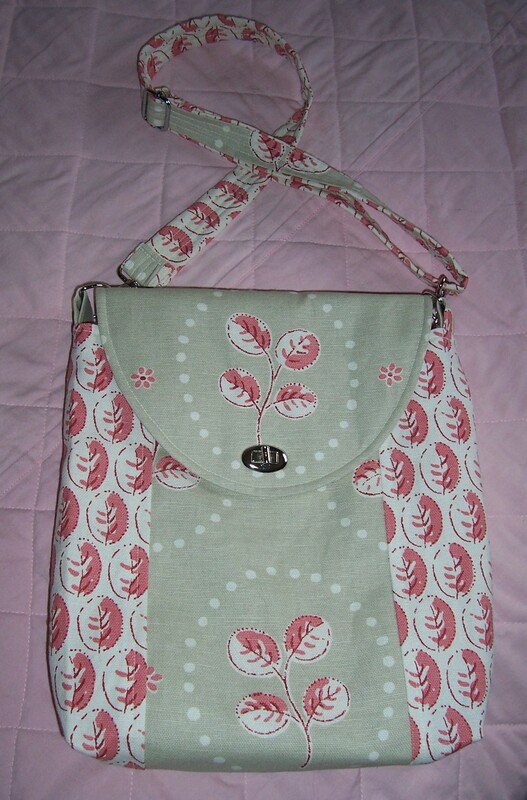 This version is made using a 100% cotton dressmaking fabric and took just 4 hours to finish. The reduction in time taken is due to three factors; 1- the fabric is a great deal easier to handle, 2 – I did not need to “fussy cut” the design and 3 – I now know a lot more about the method of construction having also discovered a few short cuts to reduce the construction time. 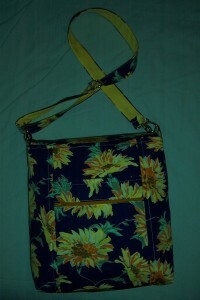 As you can see this fabric has a bold design of Sunflowers on a Dark Blue background. All stitching, including the top-stitching was completed in Pale Yellow thread. I used a plain Yellow cotton for the lining – both fabrics and the two zips came from my stash and so count towards my stash-busting campaign. I am very pleased with the end result which will co-ordinate well with my denim-based casual outfits and also add an “accent” to plain-coloured dresses. 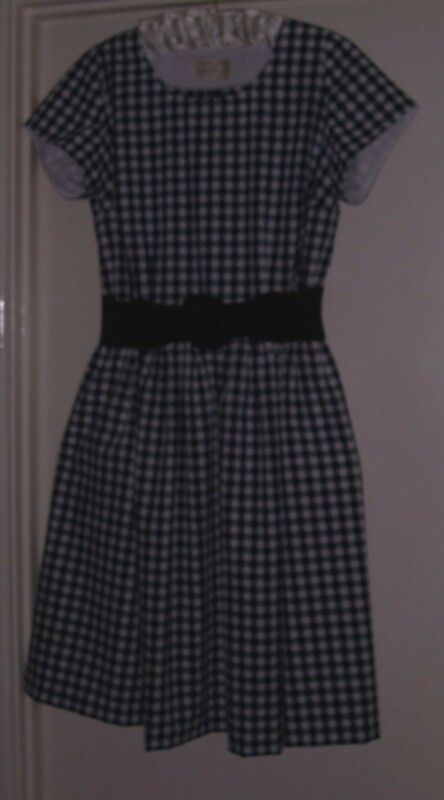 It has been my practice for the last 40-odd years to make a new dress to wear for my birthday. What with one thing and another, this year this has not happened in time! Prior to the birthday I had decided to use some lovely floral border print cotton that I purchased recently from The Fabric Godmother. As the fabric was so good I did not want to make any mistakes with the dress so thought I would make a “test” garment to my desired design of a fitted bodice with scoop neckline and possibly sleeveless. 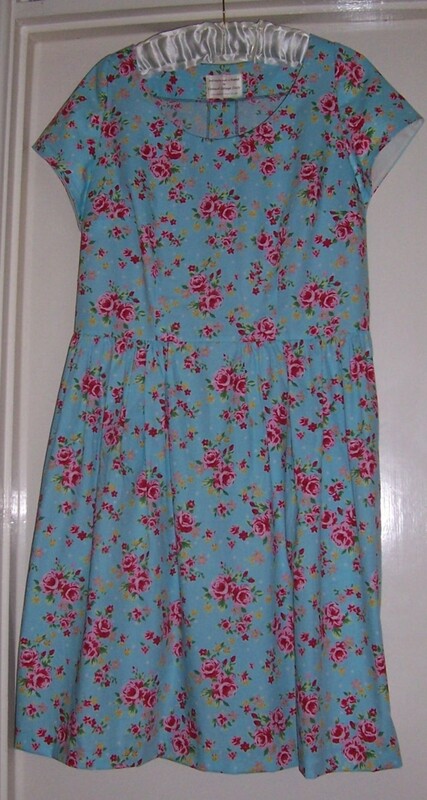 To make the tester I would use some Duck Egg Blue floral print from Fabricland. I drafted the new neckline onto my TNT bodice pattern and noted that the armholes were sufficiently high enough that should I go sleeveless I would not be displaying my underwear! The fabric was cut and the bodice sewn to first fit stage. The neckline looked great but I decided then that I would not go sleeveless, so cut and fitted the usual sleeves and sleeve linings. When fitting the sleeves I found it necessary to reduce the width of the shoulders which has made them rather narrow so next time I will re-draft the neckline to provide a bit more width at the shoulders – this will also prevent the dress from slipping off the shoulder and displaying my bra straps. There is also some slight “gaposis” in the neckline so the re-draft will help remove that problem. The bodice is fitted but is not so close that I need to have a zip at the back, so scrub that and I stitched up the centre back seam of the bodice and skirt. The skirt has concealed pockets in the side seams – again my TNT pattern where the pocket bag is stitched into the waistline seam and prevents them from flapping about inside skirt. The skirt is gathered for a very feminine look which in this fabric seems to suit better than the unpressed pleats that I have used previously. The skirt has a 1.25” hem which is hand stitched. Result is a wearable tester dress which has helped me to identify a couple of areas for correction before I sew up the Border print – Belated Birthday Dress! I was recently introduced to Deby Coles of So Sew Easy on Craftsy by a friend from the Franklins, Salisbury Patchwork and Quilting Group. Maureen was carrying a bag which she told me was by Deby and called the Cross Body Bag. 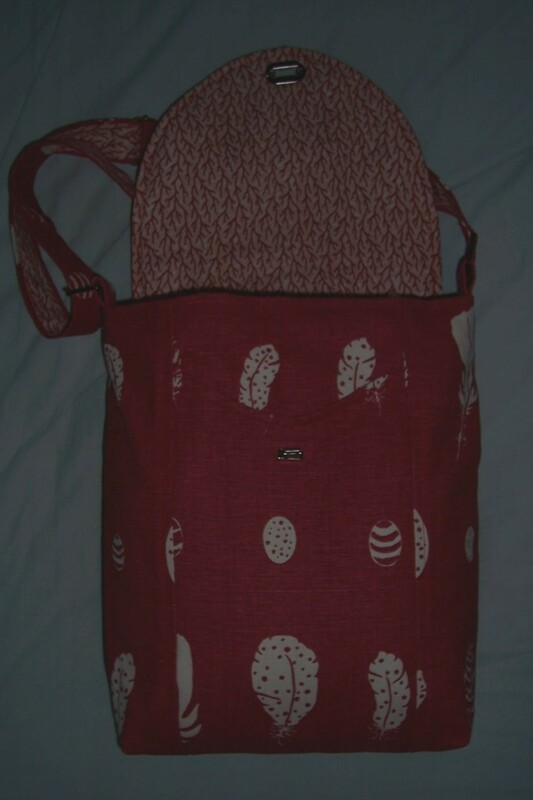 I have purchased the pattern and following a couple of sessions when I watched the video tutorial I decided to use some heavyweight furnishing fabric in two complimentary prints that had been donated by another friend, to make the bag. For the lining I would use some Cream Damask that I bought several years ago from the Remnant Department of Oswaldtwistle Mills. Inspired by the demonstration bag I would use similar bag hardware to that featured – a twist lock fastening, D rings, swivel hooks and a slider to convert the strap from “cross body” to “shoulder”. It has taken a couple of weeks for all the hardware to arrive but today I was able to set aside the afternoon (and early evening) to make the bag. The instructions were printed off and read through prior to embarking on the cutting of the fabrics. I had decided to use these two complimentary prints in shade of Pink and Duck Egg Green for the bag and was most fortunate in that the remnant used for the side panels was exactly the correct depth as dictated in the cutting plan. As the surface fabric was so robust I decided to forego using interfacing but I did use fusible wadding on the lining pieces and inside the flap. I made a slight error when cutting the centre panel for the front of the bag and thus the design is off centre but otherwise I think the “fussy” cutting has worked well. The finished size of the bag is approximately 10 inches wide x 11.5 inches tall x 2 inches deep plus the strap which was cut 44 inches long. The design of the bag is quite complex in that the reverse has a zip pocket plus a slip pocket, the front panel has a slip pocket with shaped top. 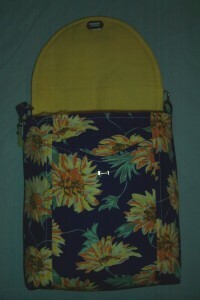 Inside there is another zip pocket and a slip pocket with machine-stitched divisions. The strap has a special feature in that it is made from the two fabrics stitched together in such a way as to produce a faux piping along each side. 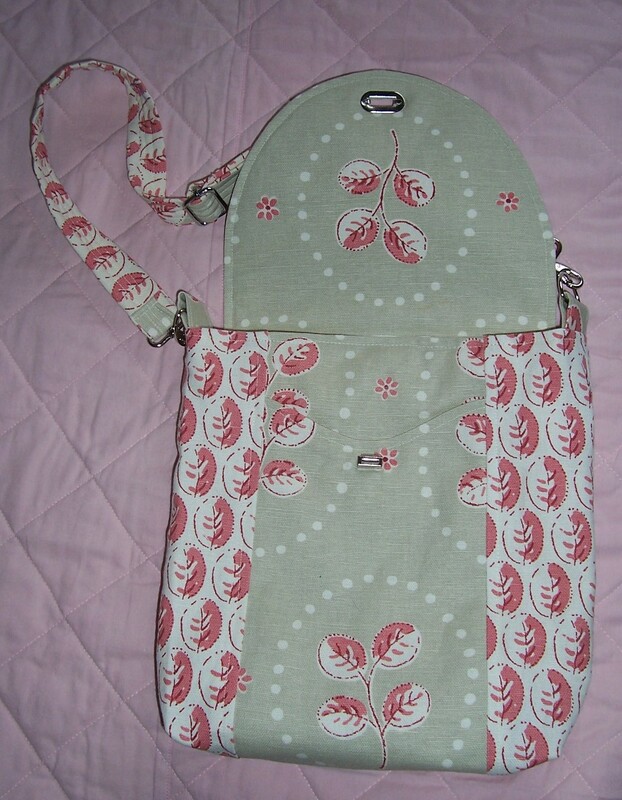 Turning the strap through to the right side was a struggle but again I am pleased with the end result and will use this method again for another bag. 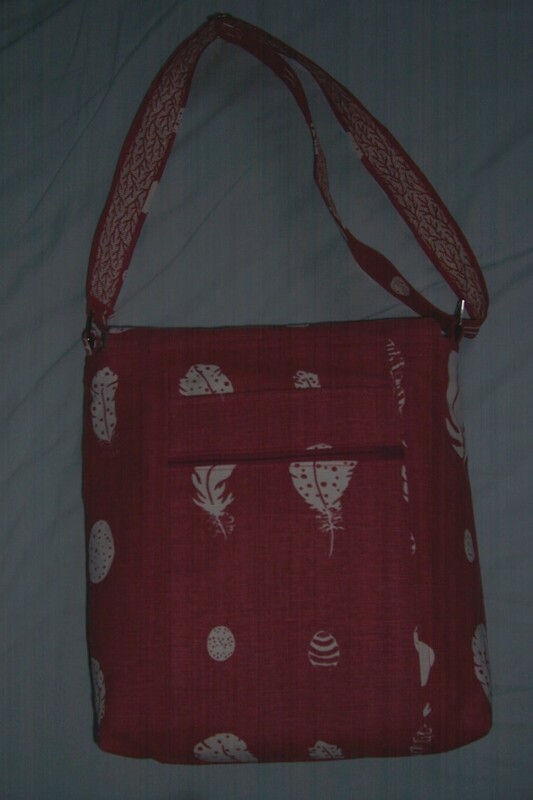 Now having purchased several sets of bag hardware and completed my first bag I feel confident about making another. 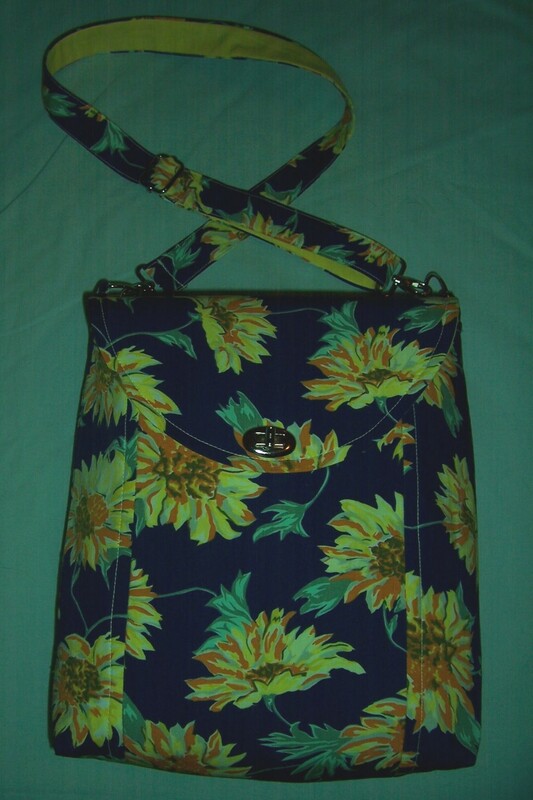 Next time I will use a dressmaking cotton fabric remnant of Dark Blue printed with flamboyant sunflowers. Finished!! 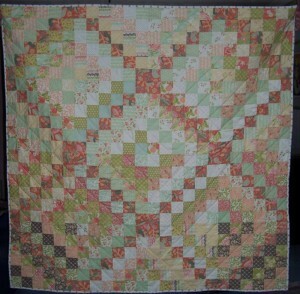 I spent an enjoyable afternoon quilting and attaching a narrow binding to the quilt which is now completed. The finished size is 50” square. I am not sure how this happened as the blocks are 12.5”  before stitching together. All I can think is that my scant 1/4” seam allowance is a VERY scant and over the 16 blocks this has increased the overall size of the quilt. The colours of this project do not fall into my usual range as they came from a jelly roll that I  had in my stash. However, I am delighted with the end result. 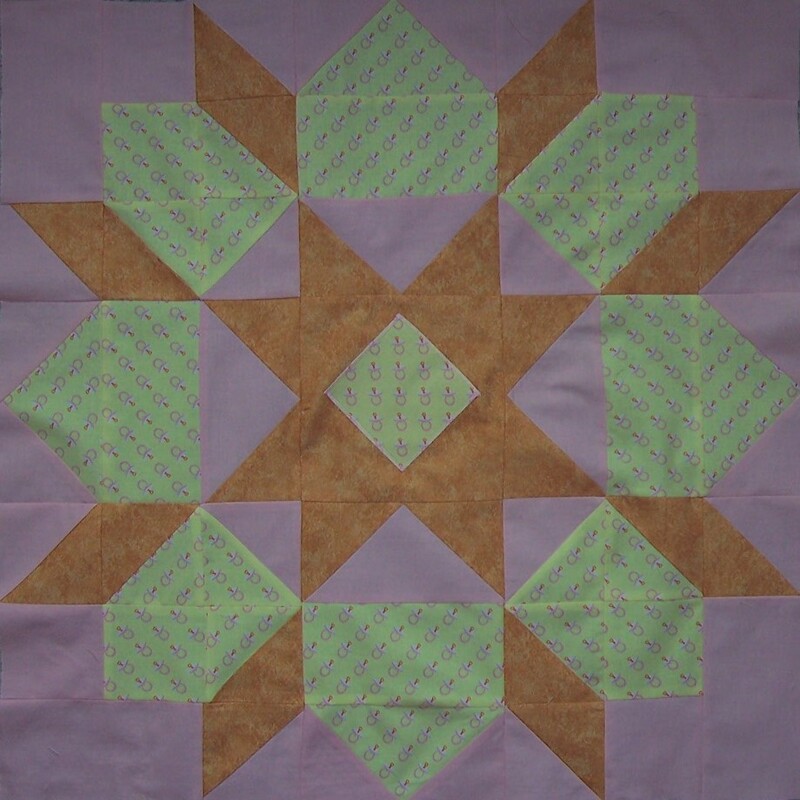 This block was one suggested at Sprat & Winkle as a possible design for making the 24” square quilts for the Special Baby Care Unit at Winchester Hospital. Cutting and stitching this block made me swoon! It was definitely a challenge. At the club meeting I soon discovered that as one of my chosen fabrics had a one-way design it was going to be a “random direction” swoon! I had already cut the pieces from two fat quarters in the main prints which left only the background to be cut. 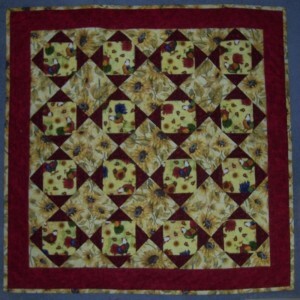 A problem – I could not fathom how I would be able to get the required pieces from my remaining fat quarter of fabric. So for a couple of weeks the project was put to one side – not quite in the “Roundtuit” box but very nearly! This weekend I determined to clear some of the backlog of unfinished projects and this block was near the top of the pile. I decided to use an alternative fabric for the background and set about cutting the pieces. The construction of the block went together very quickly and for the most part the seams match! I decided that the centre square looked a bit boring and as I happened to have a small square of the “dummy” print left over have added that as an applique set “en point”. 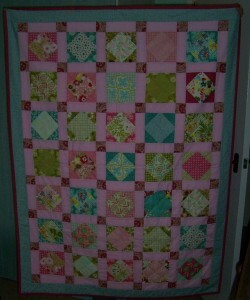 Now I have to complete the quilt with wadding, backing and quilting which I hope to get done tomorrow. Watch this space…..